BU's defense corps for 2010-11 now lines up with junior Dave Warsofsky, sophomores Max Nicastro, Sean Escobedo, Ben Rosen and Ryan Ruikka, and freshmen Adam Clendening, Patrick MacGregor and Noonan. 2010 recruit Charlie Coyle returned from the NHL combine in Toronto where he interviewed with 27 of 30 NHL teams and “finished in the top 10 in several categories during fitness training,” is expected to be a late first-round or early second round choice in the June draft. The Newburyport News reports that BU has strong interest in power forward Derek Freeman, who led Newburyport H.S. to the Mass. Div. 2 title game this past season. Freeman, a senior who attended the BU Hockey Showcase last summer, will play a year or two of junior. Terrier Associate Head Coach Mike Bavis has arranged for the 6-3, 215 wing to try out in June with the USHL Cedar Rapids Roughriders where 2011 recruit Cason Hohmann just completed a successful rookie season. Chris Bourque is the Hershey Bears leading playoff scorers as the Washington Caps’ AHL affiliate enters the Calder Cup finals against Texas beginning this Thursday. Bourque has a 7-16-23 line in 15 post-season games after registering 70 points in 49 regular-season games. The Bears are seeking to repeat as AHL champs. USHR reported that former BU All-American Shawn McEachern has left his position on the UMass-Lowell coaching staff to become head coach and athletic director at The Rivers School in Weston, Mass. A 14-year NHL veteran with 256 career goals, McEachern was a Hobey Baker finalist in 1991 when he scored 82 points to lead BU to the NCAA championshp game. He was inducted into the BU Athletics Hall of Fame in 2008. McEachern told USHR: "I've always wanted to be a head coach, and, as I went around to different boarding schools while working as an assistant, I noticed that it was a good lifestyle the coaches at those schools were leading. The Tampa Bay Lightning Web site looks back at the battle with cancer that cut short the pro career of John Cullen, BU’s all-time scoring leader with 241 points and a 1995 Hall of Fame inductee. Now fully recovered, Cullen reflects on his battle and the ups and downs since his playing days ended. The Terriers completed the defensive part of their 2010 recruit class when they received a commitment from bruising Vernon Viper defenseman Garrett Noonan. The 6-1, 205 left-shot blueliner is a Norfolk, Mass., native who starred at Catholic Memorial before helping the Vipers and fellow 2010 recruit Sahir Gill win a second consecutive RBC Cup, Canada’s Junior A Championship, earlier this month. For the Vipers, Noonan registered a 2-16-18 line with 60 PIMs during the regular season, adding 4 goals and 5 assists in Vernon’s playoff run, including the final goal in the RBC Cup championship game. Video: Noonan scores the final goal on this YouTube clip. Noonan will be the third former Viper, along with Gill and Ryan Santana, on the 2010-11 Terrier roster. At BU, Noonan will play for three coaches who also were CM standouts: Jack Parker, Buddy Powers and Mike Bavis. Throughout the 1990s when BU reached the Frozen Four X times, CM recruits, including Mike and Mark Bavis, Mike Prendergast, Chris O’Sullivan, Mike Sylvia, Jeff Kealty and Tom Noble, were instrumental in the Terriers’ success. Noble, Prendergast and Sylvia were members of BU’s 1995 national championship team. 2010 recruit Charlie Coyle shared his thoughts with New England Hockey Journal following the first day of the NHL combine in Toronto. 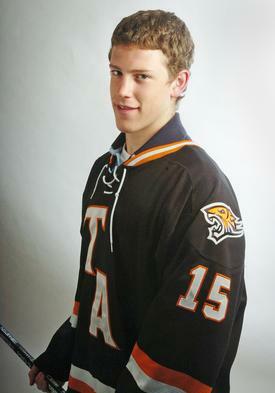 2010 recruit Charlie Coyle is one of 100 draft-eligible prospects attending the NHL combine in Toronto this week. The Scouting Report has ranked Coyle at #35 for the June draft, calling him "a big winger that moves well on the ice and isn’t afraid to go to the dirty areas. He competes hard in the corners and has a good scoring touch in front of the net." While Terrier fans are aware that Coyle is the cousin of BU and NHL standout Tony Amonte, the South Shore Kings forward has a second family connection to the NHL. He's also a cousin of Weymouth's Bobby Sheehan who played 310 NHL games, including stints with Montreal, Chicago, the Rangers, Detroit and Los Angeles, as well as the WHA's N.Y. Raiders. 2013 recruit Matt Gryzelcyk, defenseman who played at Belmont Hlil last season, has been added to the 2010-11 roster of the NTDP U17s. David Warsofsky, who will be a BU assistant captain next season, is the most recent Terrier blueliner to come through the NTDP program. 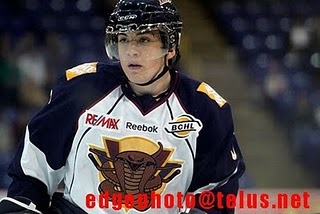 2011 recruit Alexx Privitera will play for the U18s next season. Kevin Shattenkirk, Colby Cohen, Ryan Whitney, Bryan Miller, Freddy Meyer and Pat Aufiero are are BU defensemen who played for the NTDP. Former Terriers and U.S. Olympians Mike Eruzione and Jack O'Callahan will be featured at a BU Alumni event in Chicago tonight. Details about the "Miracle on Ice" themed gathering are here. Terrier women’s hockey head coach Brian Durocher, who coached BU to its first Hockey East title last season, has scored a pair of recruiting coups, getting 2010 commitments from two members of the gold-medal winning Canadian Olympic hockey team, according to The Daily Free Press. Eighteen year old Marie-Philip Poulin, at 18 the youngest member of her Olympic team, is a forward with high-end offensive skills, leading the Canadian media to call her the “Sidney Crosby of women’s hockey. She scored both goals in Canada’s gold-medal game win against Team USA and previously set the scoring record (31 points) for the Canadian U18 program. 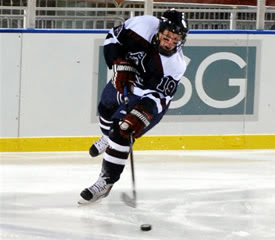 Poiulin has already performed on the Walter Brown Arena ice, skating with Dawson College in a 2008 exhibition game against BU. The other Olympic recruit is defenseman Catherine Ward. Prior to last season, Ward played at McGill University for three seasons, earning CIS rookie of the year honors in 2006-07 and being named CIS First Team All-Canadian all three years. Ward will have one year of eligibility at BU. Last winter, USCHO reported that UNH standout forward Jenn Wakefield was transferring to BU after spending last season training with the Canadian Olympic team. Wakefield was Hockey East’s Rookie of the Year in 2007-08 and a league all-star in her two seasons as a Wildcat, scoring 95 points. She also was a Patty Kazmaier Award finalist in 2008-09. Durocher, co-captain of BU’s 19778 national champions, has been named as an assistant for the 2010 U.S. Women's Under-18 Select Team that will take part in the 2010 USA Hockey Women's National Festival prior to playing a three-game series against Canada in mid-August. This past Saturday night, 1994-95 Terrier captain Jacques Joubert was among the class of six inducted into the BU Athletics Hall of Fame. Joubert scored 29 goals for BU in his senior year, including one in the 6-2 win against Maine in the 1995 national championship game. Former Terrier assistant coach Pertti Hasanen has launched Hasanen Power Wear, an innovative company committed to developing safe and functional weighted training gear. Last week, USA Hockey announced that Hasanen Power Wear will serve as its official weighted training gear sponsor and will provide sets of its training equipment to USA Hockey's National Team Development Program. In the USHL futures draft held today, BU 2012 recruit Robert Polesello (Toronto Jr. Canadians) was selected 7th overall by Indiana. Two picks later, Gavin Stoick, a power forward from Colorado whom BU has been recruiting (along with Harvard,Cornell, Yale, and Michigan) was taken by Green Bay. Belmont Hill's Matt Grzelcyk (photo), a 2013 recruit went in the fourth round to Youngstown. Alexx Privitera's younger brother Jarrid (North Jersey Avalanache)--a Brad Zancanaro-sized forward with a scorer's touch--was the first pick in the 5th round by the new Dubuque franchise. Team USA won its final relegation round match, defeating Italy 3-2 in a shootout, in the IIHF World Championships in Germany. After losing three preliminary round matches, each by one goal, the USA won all three relegation round games and will remain in the top division for next year’s World Championships. Matt Gilroy, who had a hattrick against Kazahkstan, assisted on the second U.S. goal against Italy. 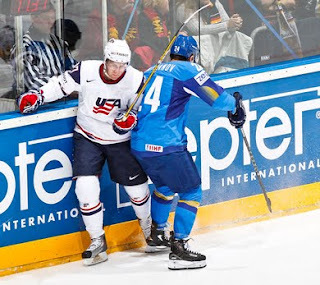 Former Terrier co-captain Matt Gilroy registered a hattrick in Team USA’s 10-0 win over Kazakhstan in the relegation round of the IIHF World Championships. Gilroy news feature. Joe Sacco, a 63-goal scorer at BU and an assistant coach of Team USA, played in six World Championships (2002, 1996, 1994, 1992, 1992, 1990). John McCarthy, also a co-captain on BU’s 2009 national champs, has been called up from Worcester to the Sharks “taxi squad” as San Jose prepares to take on Chicago in the Western Conference files. Chris Bourque, whose overtime goal won the 2005 Beanpot championship, had the game-winner in OT as Hershey edged the Monarchs, 3-2. 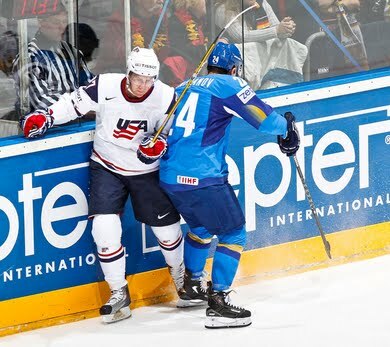 USA Hockey.com caught up with former Terrier co-captain and Hobey Baker winner Matt Gilroy at the IIHF World Championships, his first experience representing his country. Red Line Report, an independent international scouting service that annually ranks college recruit classes, has pegged the Terriers’ 2010 class as third best, behind Minnesota and North Dakota. Earlier this year, College Hockey 247 ranked the top 50 recruits for 2010 with four Terrier recruits making the list: LW Matt Nieto (#3) , RW Charlie Coyle (#15), RD Adam Clendening (#22) and LW Sahir Gill (#39). Former Terrier netminder Tim Regan has been a member of the BU Athletics Hall of Fame since 1993. Last Wednesday, the Most Outstanding Player in the 1972 NCAA tournament and former standout at LaSalle Academy was inducted into the Rhode Island Interscholastic League Athletic Hall of Fame. Among those in attendance were former Terrier John Grady, Tom Mellor, a teammate on the 1972 U.S. Olympic team, and blog contributor CDRAL. Regan, who teamed with Dan Brady in goal to lead BU to back-to-back NCAA titles (1971 and 1972), holds the Terrier single season records for save percentage (.929) and goals against average (1.77). After earning a Silver medal at the 1972 Sapporo Olympics, Regan replaced an injured Brady for the then-four-team NCAA tournament. After yielding an early goal in BU’s 4-1 semifinal win over Wisconsin, he blanked Cornell, stopping all 39 shots in a 4-0 win. Former Terrier All American forward Boomer Ewing, now skating for the ECHL Reading Royals, is playing in game seven of the Royals' American Conference final series against Cincinnati tonight. Last year, Ewing was the ECHL's rookie of the year, playing for Wheeling. 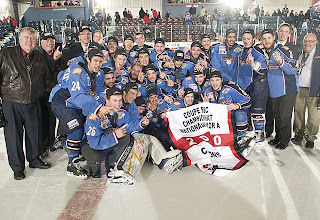 Winning a national championship twice in a row is tough on any level, but the Vernon Vipers have done just that with back-to-back titles in Canada’s RBC Cup, the nation’s junior A hockey tournament. 2010 recruit Sahir Gill chipped in a goal and an assist in Vernon’s 8-1 win in the championship game over tourney host Dauphin. The hosts had dealt Vernon its only loss of the tournament, 6-5 in a preliminary round game. Gill finished the tournament with a 3-4-7 line, two points behind linemate Kellen Jones for the team scoring lead. In 32 post-season games, Gill scored 9 goals and 17 assists. Last year, Gill and rising sophomore Ryan Santana were members of Vernon's 2009 RBC Cup champs. Matt Gilroy isn’t the only former Terrier blueliner playing in the IIHF World Championships in Germany. A sharp-eyed blog reader points out that Jakabs Redlihs, a 2002-03 Hockey East All-Rookie team member, and a four-year player at BU, is skating for Latvia, Currently a member of Dynamo Riga, he is a teammate of his younger brother Mikelis, who represented Latvia in the Vancouver Olympic games along with oldest brother Krisjanis. Both the U.S. and Latvia have 0-2 records after two games. 2010 recruit Sahir Gill’s third-period goal ignited the Vernon Vipers’ 4-goal comeback in a 4-2 win over Brockville at the 2010 RBC Cup tournament in Dauphin, Manitoba . The victory sends defending champion Vernon to the tournament semifinals, a rematch with Brockville tomorrow afternoon. With four points in the tournament (2+2), Gill is tied for the team lead in scoring. Matt Gilroy’s college career ended to soon for him to participate in this season’s Frozen Fenway game vs. BC, but outdoor hockey on a world stage still is in the cards for him. Gilroy is a member of Team USA which begins play in the IIHF World Championships in Gelsenkirchen, Germany, today, taking on the host team in a 76,000-seat soccer stadium. Link to live stats. Game notes. Hockeysfuture.com, rating the Phoenix Coyotes’ top prospects, reports that former Terrier captain Sean Sullivan, coming off his best pro season (12-37-49), is one of the two “most NHL-ready defensemen in the Coyotes system. Citing conduct “unbecoming of a Boston University hockey player,” head coach Jack Parker has dismissed brothers Vinny and Victor Saponari from the Terrier hockey program. At the same time, junior center Corey Trivino was suspended and will miss an undetermined number of games at the beginning of next season. Victor, the older brother, had only played 14 games in three seasons, but his younger brother, an NHL draftee and a product of the NTDP program, had been an important contributor in his two seasons at BU, registering 20 goals and 27 assists. Vinny Saponari told The Daily Free Press that he was shocked by the coach’s decision and is evaluating his future plans, which may involve transferring to another Division 1 school. Daily Free Press news report. BOSTON - Junior Victor Saponari and sophomore Vinny Saponari have been dismissed from the Boston University men’s ice hockey program and sophomore Corey Trivino will be suspended for multiple games at the beginning of the 2010-11 season, head coach Jack Parker announced on Tuesday. Victor Saponari played in 14 games over his three seasons with the Terriers and recorded two points - both assists. Vinny Saponari appeared in 82 contests over the last two seasons and totaled 47 points on 20 goals and 27 assists. 18a) in 60 career games. He missed the final 10 contests of the 2009-10 campaign with a fractured right fibula. Matt Gilroy, a member of Team USA, begins play in the IIHF World Championships in Germany on Friday. The U.S. beat France in an exhibition game, 3-1 . Former Terrier forward and first-year head coach of the Colorado Avalanche Joe Sacco is an assistant to Team USA head coach Scott Gordon. 2010 recruit Sahir Gill and the Vernon Vipers have a 2-1 record after three games of the RBC Cup, the Junior A championship of Canada. Gill has one goal and two assists in the three games. He opened the scoring for the Vipers in yesterday’s 4-2 win over Oakville. Vernon plays its finally preliminary round game today against the Brockville Braves.